How To Be Fabulous. 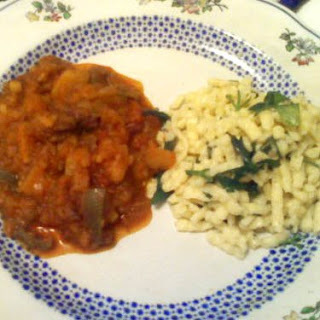 : Recipe: Stephanie's Goulash! -Heat butter and olive oil in large pot. Toast caraway seeds. Add onions, and cook until brown. Add potatoes, parsnips and carrots. Cook until soft. Add celery, garlic, bell pepper and tomatoes. Add paprika, salt and pepper. -In a separate iron pan, brown bison (or beef). -Add meat to pot, and add water or broth to cover. Cook for serveral hours. Check flavoring, and adjust. Cook until meat is falling apart. Break meat apart with fork. Cook longer. -Serve with spatzle (from Germany!) Cook spatzle in boiling water, 16-18 minutes, until very soft. Add butter and chopped parsley. Dine in This Shrine to Cheese!